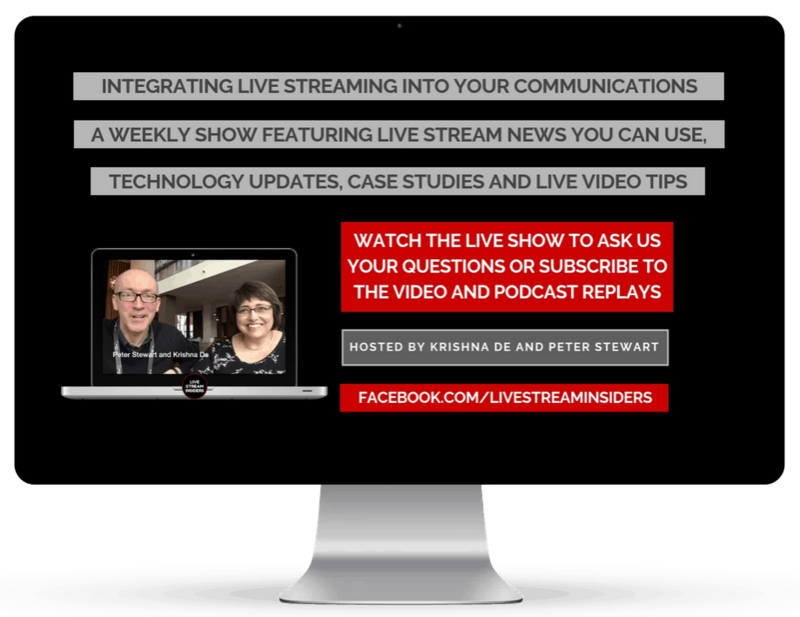 The Live Stream Insiders is a live video show, produced and hosted by digital marketing strategist and visual marketing speaker and mentor Krishna De and she is accompanied by her co-host, journalist Peter Stewart. With effect from the 17 February 2019, the show will be live streamed twice a month as we will also be live streaming a new podcast about voice and podcasting technology called the Smart Speakers Podcast. Live Stream Insiders will be broadcast on the first and third Sundays of each month. During the show they cover the latest live video news, technologies and case studies of organisations who are integrating live video and live audio into their marketing and communications..
Now in our fourth year of broadcasting, the Live Stream Insiders is the longest serving live stream case study show and one that gives viewers the opportunity to learn about new live stream technology, trends, tips and news. 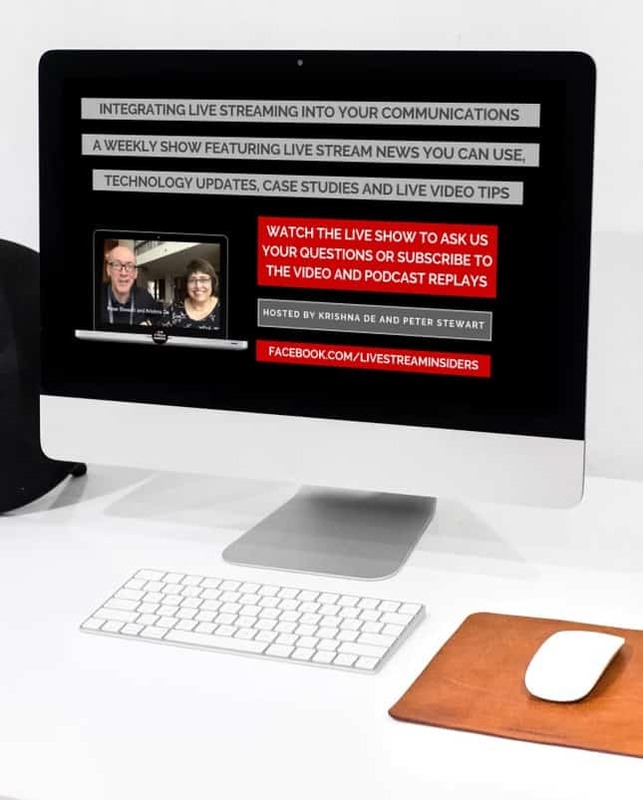 The objective of the Live Stream Insiders is to highlight best practice in using live streaming for your organisation and to encourage and inspire others to explore the established and emerging platforms that allow us to use real time media to connect and communicate with audiences and stakeholders. This may be for marketing, social selling, employee engagement or even crisis management. Subscribe to the show on YouTube to access updates as the replays are posted. Or subscribe to the podcast of the Live Stream Insiders show on Spreaker. Subscribe to the Live Stream Insiders as a podcast on Apple Podcasts. Subscribe to the Live Stream Insiders as a podcast on Google Podcasts. Or listen to the Live Stream insiders on TuneIn, Stitcher, or iHeart Radio (if you are in the US) and you can find us at ACast, Radio Public, PodNews and at PodLink where you can listen to the latest episode. You can also find the Live Stream Insiders Podcast on Overcast (a really handy free tool which allows you to listen to the podcast as straming audio from a website, change the speed that you listen and also create a link to share a podcast episode from a specific time stamp. Find links to all the resources shared for each episode here. The show extends the interview series where we had the opportunity to hear from organisations using Google Hangouts On Air in their business. With new mobile and desk top live streaming platforms emerging in 2015, we thought it was time to re-visit some case studies but this time feature European based businesses and especially those who may not well known. The show is currently hosted on Facebook using Facebook Live and the format is a 30 minute weekly show with news and when guests are with us the show can be 45-60 minutes including our weekly news. We live stream at 7 pm (2 pm ET) every Sunday. 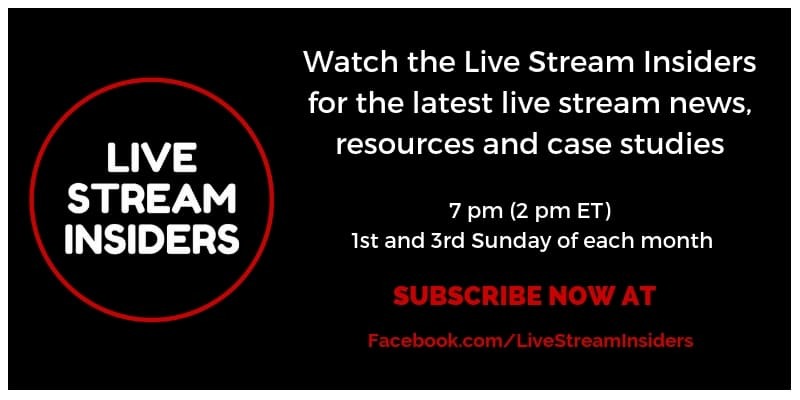 The Live Stream Insiders is recorded so you can watch a replay – access the replays on YouTube here and on Facebook Live here. Listen to the audio version of the show here. Krishna is a communications strategist – she is a professional speaker, and trains and educates marketing, marketing, media and communications professionals in how to integrate social media, live streaming and mobile marketing into their communications plans. She has spoken at numerous conferences on the topic of live streaming alongside experts from Google, Facebook, Twitter, the BBC and ABC News Australia and she delivers workshops on the topic of live streaming. She is a regular speaker and panel moderator at MoJoFest (formerly RTE MoJoCon) where she has both delivered workshops and hosted sessions on the topic of live streaming for mobile journalists. Her writing on the topic of live streaming has appeared in numerous industry publications and in 2017 and 2018 she was nominated for her live stream production and hosting in the Streaming Media Awards. Peter is a social media and video producer with the BBC and is the author of multiple books on broadcast journalism. He regularly hosts mobile Facebook Livestreams for his organisation in terms of sharing hyperlocal news stories, going live with just his smartphone and a lavalier microphone. Together they use their complimentary skills and their passion for live streaming and mobile journalism to host the Live Stream Insiders where they share best practice case studies, news and events related to live streaming with a particular focus on the UK and Ireland. how to grow and nurture an engaged audience for your live streams. You can follow the Live Stream Insiders Twitter channel here and on Facebook here. Find us on Facebook sharing tips and updates on the world of live streaming. Watch forthcoming episodes of our shows by subscribing to us on YouTube. 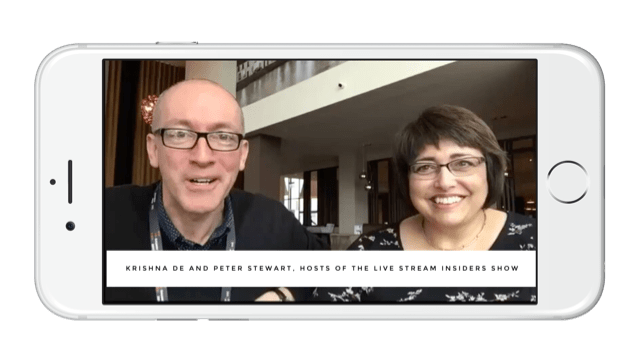 Some of our earliest guests included Sue Aston who is a musician and composer and we explored how musicians can use live streams – Sue was joined by her husband and live stream producer Phil Aston. We have been joined by the communications manager for Kingston Police Force in the UK who shared with us how they have been integrating live streaming using Periscope.tv into their communications. We also covered the ethical issues of using live streaming at the time of human and natural disasters. We have covered great gift ideas for live streamers in our Christmas gift show in 2015, 2016, 2017 and 2018. We have discussed how to keep your tween and teen safe when they use live streaming platforms including Periscope, Facebook Live and Snapchat. We were in conversation with marketing authority and author David Meerman-Scott on the topic of using live video for real time marketing. We have explored how journalists at Irish National broadcaster RTE are using live streaming for news and events. We interviewed BBC York on their early use of Periscope and Facebook Live for audience engagement. We have shared presentation tips for high impact live streams. Learn how to do so in this video tutorial.